Yesterday, during the ceremonies for the Presidential Medal of Freedom awards, President Barack Obama offended the Polish people by making a serious mistake when he said that Jews were killed in a “Polish death camp.” This implies that it was the Polish people who were killing the Jews in death camps. 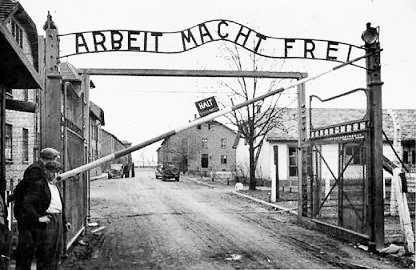 Obama on Tuesday labeled the Nazi facility used to process Jews for extermination as a “Polish death camp.” The White House later said the president “misspoke” and expressed “regret”. The linguistic faux pas overshadowed Obama’s posthumous award of the highest US civilian honor, the Presidential Medal of Freedom, to Jan Karski, a former Polish underground officer who provided early eyewitness accounts of Nazi Germany’s genocide of European Jews. Between 1939 and 1945, nearly six million Polish citizens perished under Nazi Germany’s brutal World War II occupation of their country. More than half of Poland’s victims were of Jewish origin and they, in turn, accounted for half of the six million European Jews who perished during the Holocaust. Many were killed in death camps set up by Nazi Germany in occupied Poland — including the most notorious, Auschwitz-Birkenau. 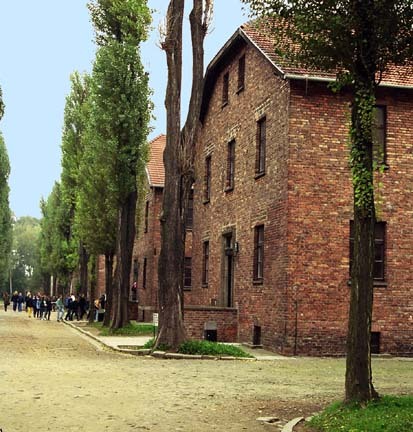 You can read about the history of Auschwitz-Birkenau on my website here. On the map above, the dark brown area shows the “General Government,” which was the name for German-occupied Poland after Poland was defeated by the Germans in September 1939. The dark orange section shows the portion of today’s Poland which was in the Greater German Reich during World War II. The Greater German Reich is shown in the whole orange section, including the dark orange part. 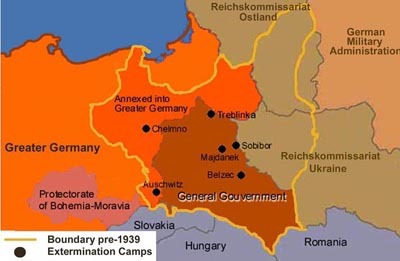 The six “extermination” camps were in what is now the country of Poland, shown in the area outlined in yellow. The two maps below show Germany before World War I and after World War I. The Germans blamed the Jews for the loss of World War I and they were mad as hell. That is why they wanted the Jews out of Europe, among other reasons. On the map above, note the German province of Silesia, where Auschwitz-Birkenau was later located. 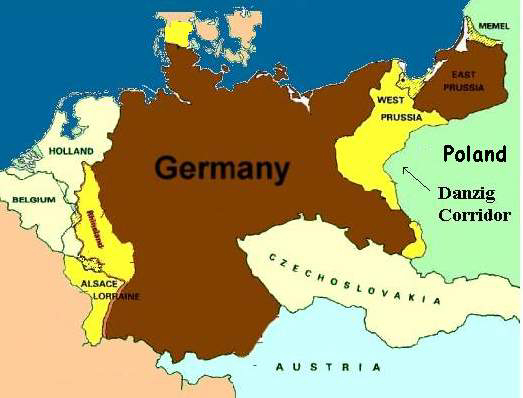 The map above shows what was left of Germany after a huge chunk of German territory was given to the new countries of Poland and Czechoslovakia after World War I. 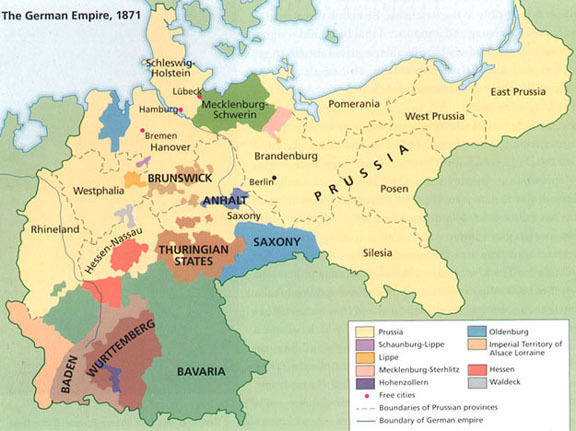 Notice how East Prussia was cut off from the rest of Germany by the Polish Corridor. It was a dispute over the Polish Corridor, among other reasons, which led to World War II. This morning I spent a lot of time reading about the air photos of Auschwitz-Birkenau taken from American reconnaissance planes in 1944 and 1945. I downloaded the photos from the website of Germar Rudolf here. In case you don’t know who Germar Rudolf is, he was the first highly qualified Holocaust revisionist, by virtue of his education and intelligence. His books are highly scientific and technical — no hatred nor anti-Semitism involved — just the facts. You can get to know Germar Rudolf on his website here. The pdf files about the air photos which you can download from Germar Rudolf’s website include photos taken from the Auschwitz Album. These are photos taken by the Germans during the time that the Hungarian Jews were arriving at Birkenau. These photos are used by Holocaustians to prove that Jews were gassed, but actually, they prove the opposite. The pdf files that you can download from Germar Rudolf’s website explain where and how the photos were altered by the CIA. The area where the two main crematoria were located has been changed by the building of the International Monument between Krema II and Krema III. Tourists can no longer see that the main camp road went on into the countryside where there were farms very near the camp. 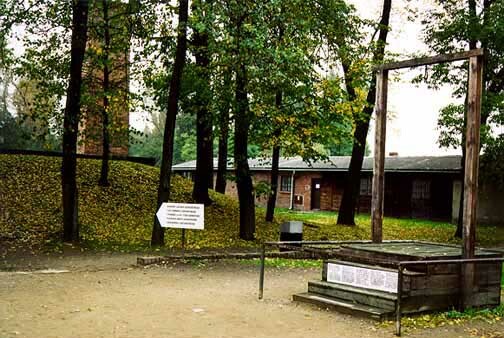 The International Monument has been built over the intersection of the main road and the road to the Sauna where the Jews took a shower before entering the camp as prisoners. The aerial photos show that the soccer field was very near one crematorium and that there were 12 kitchens near the crematoria. The photos show that there was no secrecy surrounding the crematoria; the prisoners could see everything that was going on. The CIA altered the aerial photos to show high fences around some of the buildings. 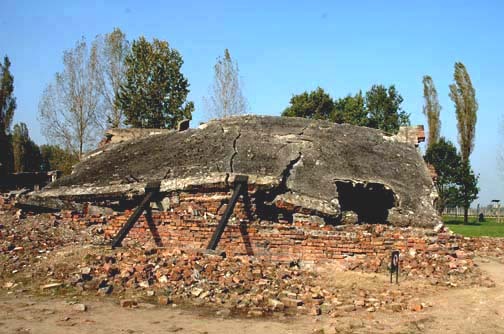 The alternations done by the CIA show little chimneys where the Zyklon-B gas could have been poured in, but photos taken by the Germans do not show these openings. The bottom line is that there is no air photo evidence to support the claim of mass murder at Auschwitz-Birkenau. You can read it here. On Tuesday, May 29, 2012, President Barack Obama will give the Presidential Medal of Freedom to Bob Dylan and posthumously to Jan Karski. What do these two men have in common? Nothing — I just wanted to get your attention. Most Americans know who Bob Dylan is, but who was Jan Karski? During a ceremony at the United States Holocaust Memorial Museum on April 23rd this year, President Obama spoke about Jan Karski as “a young Polish Catholic who witnessed Jews being put on cattle cars, who saw the killings, and who told the truth, all the way to President Roosevelt himself.” Jan Karski had tried to tell the world the truth, while “so many others stood silent,” in the words of President Obama. After coming to America in July 1943, Jan Karski got his PhD and then taught history at Georgetown University for many years. He became an American citizen in 1954. In the year 2000, Dr. Karski died at the age of 86. On September 1, 1939, when Germany invaded Poland, Jan Karski (not his real name) was a young soldier in a horse-drawn artillery unit, which was hopelessly outdated compared to the well-equipped German army. Karski deserted, running toward the East, but on September 17, 1939, the Soviet Union attacked Poland from the other side. Karski was captured by the Soviets; he barely escaped the Katyn Forest massacre which the Soviets blamed on the Germans at the Nuremberg IMT. Karski fled into one of the many huge forests in Poland and joined the Polish Underground which continued to fight throughout World War II, although not on the battlefield. Karski worked as a courier, carrying messages from Warsaw to the Polish government which was in exile in France at that time. On one of his missions, he was captured by the German Gestapo and tortured. To escape the torture, he pulled a razor blade out of the sole of his shoe and slashed his wrists. The Germans took him to a hospital and he survived. Karski escaped from the Germans and, posing as a Jew, wearing a yellow Star of David, he sneaked into the Warsaw Ghetto so that he could observe the horrible conditions there. He learned that the Jews were being sent from the Warsaw Ghetto to Treblinka, a death camp that was 60 miles to the East. 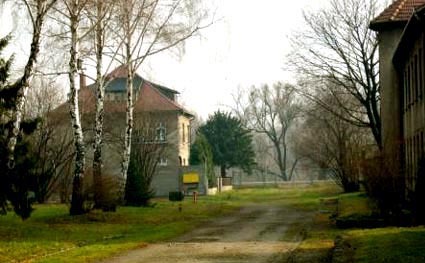 Next, Karski went to the Izbica Ghetto, which served as a transit camp for Jews who were being sent to the Belzec and Sobibor extermination camps. After witnessing what was happening to the Jews in Poland, Karski went to England where he spoke to members of the British War Cabinet, but Winston Churchill refused to see him. Then it was on to America, where Karski spoke with Secretary of State Cordell Hull, Supreme Court Justice Felix Frankfurter, and finally with President Franklin Delano Roosevelt. All of these men found his story difficult to believe. In a secret meeting with President Franklin D. Roosevelt, Karski told Roosevelt about the Auschwitz death camp and that 1.8. million Jews had already been killed in Poland. He said that commanders of the Polish Home Army (a resistance group) had estimated that, without Allied intervention, the Jews of Poland would “cease to exist” in 18 months. Still, Roosevelt refused to bomb the Auschwitz death camp. After failing to impress any of the Allied leaders, Jan Karski went public with his story. He delivered around 200 lectures and wrote a best-selling book entitled The Story of a Secret State. Still, it was several years after the war until it became universally known that Treblinka, Belzec and Sobibor were death camps where the Jews were gassed. So what did Jan Karski do to get the Presidential Medal of Freedom, if no one listened to him? 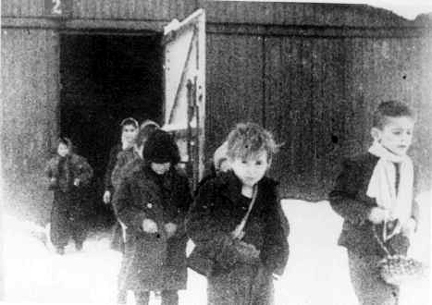 Although America did nothing to save the Jews from the gas chambers in what is now Poland, President Roosevelt did establish the War Refugee Board, a Federal agency that helped the Holocaust survivors to come to America. John Pehle, who became the head of the War Refugee Board, said that President Roosevelt decided to establish the board after his talks with Jan Karski. On May 20, 2012, I blogged about Dr. Benjamin Murmelstein, whose son, Dr. Wolf Murmelstein, wrote an essay about his father, entitled “The Last Unrighteous” — The Witness never heard. A new movie about Dr. Benjamin Murmelstein by Claude Lanzmann, which will be released soon, will be entitled Last of the Unjust. Claude Lanzmann is the film maker who created Shoah, a film which features the testimony of numerous Holocaust survivors. According to the news article, Lanzmann interviewed Dr. Benjamin Murmelstein in 1975, over the course of several days. These were the most extensive interviews that Lanzmann did, but none of them were included in the completed film. Why not? I don’t know, but possibly, it is because Dr. Murmelstein was accused, but not convicted, of collaborating with the Nazis. Filip Müller — a hero of the Holocaust? I don’t think so. I was very critical of Filip Müller in a blog post which you can read here. I quoted the testimony of Abraham Bomba on my web site here. Both Müller and Bomba are favorite targets of Holocaust revisionists because their outrageous claims tend to disprove the Holocaust. In my humble opinion, I believe that the testimony of Dr. Murmelstein also tends to disprove the Holocaust. I think that is why his original testimony for Shoah in 1975 ended up on the cutting room floor. 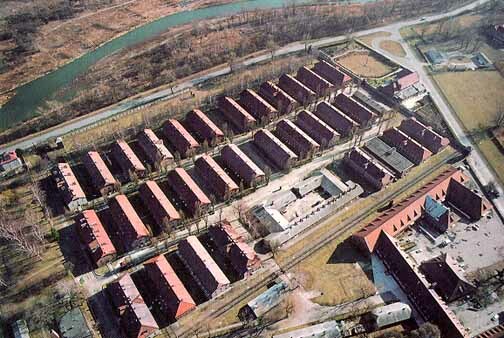 You can read an essay about Theresienstadt, written by Dr. Wolf Murmelstein, on my website here. You can read the testimony by a child survivor of Theresienstadt here. This is the year of Raoul Wallenberg, the 100th anniversary of his birth. He is being honored as a hero all over the world. As everyone knows, there were 425,000 Hungarian Jews killed in the gas chambers of Auschwitz-Birkenau in a period of only 10 weeks in 1944. Or was it 475,000? The exact number of Hungarian Jews who were gassed is unknown because the Nazis didn’t keep records on the Jews who were sent to the gas chamber immediately upon arrival. The Nazis had a plan, called “The Final Solution,” which was their plan to kill all the Jews — unless, of course, the Jews could show a passport to a neutral country. Raoul Wallenburg came along in the nick of time to save 100,000 Jews from the gas chamber by providing them with fake passports to Sweden. Or was it 20,000 Jews that he saved? The numbers vary according to which news story you read. Strangely, Hitler was O.K. with this. He wanted to kill all the Jews, but in 1943, he authorized an exchange camp at Bergen-Belsen where Jews could be exchanged for prisoners held by the Allies. 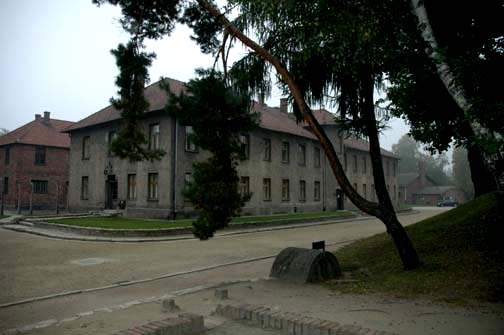 At Bergen-Belsen, there was a Sonderlager (Special Camp) where several thousand Polish Jews, who had been deported in mid-1943, were held because they were in possession of temporary passports from South American countries. In July 1938, President Franklin D. Roosevelt organized the Evian Conference at Lake Geneva where representatives from 32 countries met to decide where the German Jews could find safe haven from the coming Holocaust. None of the countries, except the Dominican Republic, wanted to accept Jews as immigrants. In America, there were laws, passed by Congress in 1924 which limited the number of immigrants from Germany. These laws had been passed for the purpose of keeping Jews out of America. In 1942, President Roosevelt violated the fourth amendment to the American constitution when he issued an order to intern Japanese-Americans and German-Americans in camps in America. He could have violated the Constitution again by overturning the immigration law that had been passed by Congress in 1924. But No! Roosevelt did nothing to save the Jews. What eyewitness testimonies had been given in 1944? Rudolf Vbera was a Slovakian Jew who had escaped from the Auschwitz-Birkenau camp in April 1944 and had told the world that 1.7 million Jews had already been killed in the gas chambers at Birkenau. How did he know this? Vrba was a Kapo whose job it was to take the luggage from the Jews when they arrived at the Judenrampe, the ramp where the Jews got off the trains before the tracks were extended inside the camp. Vrba had an eidetic memory (photographic memory) and the arrival of millions of Jews at the Judenrampe was instantly recorded in his brain. The 1.7 million Jews who arrived, while Vrba was at the ramp, were taken in trucks to the Birkenau camp and never seen again by Vrba. What could have happened to them? They were gassed, of course. Mass transports [to Auschwitz-Birkenau] began on May 15, 1944 at a rate of 12,000 people a day; they were led to believe they were being resettled, but most were sent straight to the gas chambers. Details from the Vrba-Wetzler report alerting the world to what was happening inside the camp were broadcast in Czech and Slovak on June 15, 1944, by the BBC World Service and reported several days later by The New York Times, prompting world leaders to appeal to Hungarian regent Miklós Horthy to halt the deportations. He ordered them to be stopped on July 7, fearing he would be held personally responsible after the war; 475,000 had already been deported, but another 200,000 were probably saved. Wait a minute! 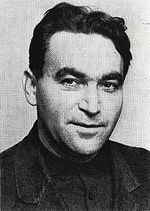 Rudolf Vrba and another prisoner named Alfred Wetzler had escaped from Birkenau in April 1944 and 475,000 Hungarian Jews were sent to Birkenau before the news that Jews were being gassed was told to the world by the BBC and the New York Times in June 1944? Why didn’t Rudolf Vrba get the news to the world leaders sooner? All it took was a passport to a neutral country to save a Jew from the gas chamber! I recall reading, years ago, the book written by Rudolf Vrba. 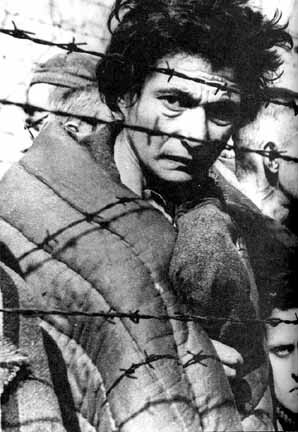 I was amazed to read that, after his escape from Birkenau, he went to visit his mother in Slovakia. His mother had not been sent to a camp? What kind of a genocide was this, if not all the Jews were sent to camps? I was also amazed to read about Vrba’s life in the Birkenau camp. He was feasting on roast chicken and drinking wine! In fact, when he and Wetzler made their escape, their pockets were filled with cigarettes and a couple of bottles of wine. As a Kapo,Vrba had been living well at Birkenau while he counted 1.7 million Jews who were taken in trucks directly to the gas chambers. The official story, as told by the Auschwitz-Museum, is that 1.3 million Jews were sent to Auschwitz-Birkenau and 1.1 million were gassed. 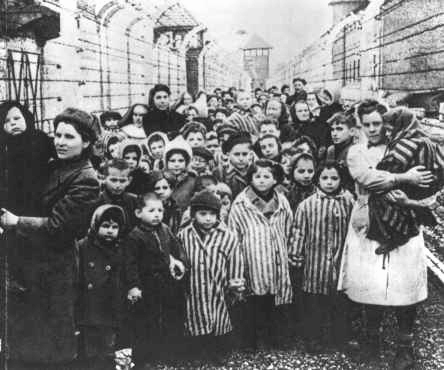 By July 1944, upwards of 400,000 Jewish men, women and children had been deported, in cattle cars, to their deaths in Auschwitz. The man directing the genocide, Adolf Eichmann, now turned his attention to the 200,000 Jews of Budapest. At this point Raoul Wallenberg arrived as first secretary of the Swedish legation. Scion of a banking family, he had studied architecture in America and done business in Europe. Nothing in his life had demanded particular courage, much less marked him for unique greatness. Wallenberg came with a single mission: to rescue as many Jews as possible. With nothing more than the authority of his character and a mantle of diplomatic licence, he proceeded to bluff, deceive and defy the Nazis. He distributed thousands of pseudo “passports” that identified the bearers as emigrants to Sweden. With bundles of such life-saving documents, he appeared at train stations and pulled Jews off death cars. He interceded at forced marches and plucked Jews from death columns. He purchased food and medicine, hired doctors and guards, protected Jews in rented safe houses. Over a period of six months, at mounting risk to his own life, Wallenberg negotiated with the Nazis, bribed them, intimidated them. Days before liberation, in his most daring stroke, he prevented a massacre in the ghetto by threatening a German general with execution as a war criminal. Wallenberg’s example inspired similar rescues by neutral Switzerland, Portugal and Spain. His actions are estimated to have saved about 100,000 lives. 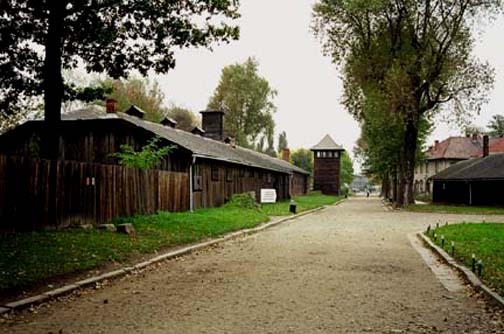 When I made my first trip to Poland in October 1998, I wanted to see the death camps and the gas chambers. Before I left on my trip, I made arrangements for a tour guide through a company in New York City. I wanted to make sure that I had a guide who spoke English. 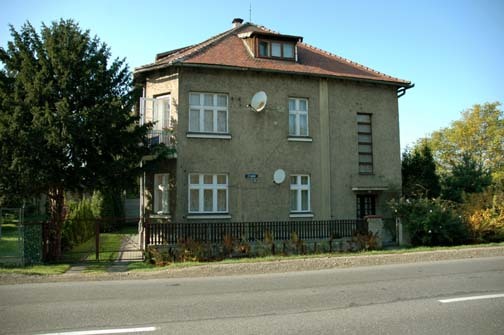 Before taking me to see the camps, my guide told me that I had to first see a shetetl so I could see what it was like for the Jews who were living in Eastern Europe during World War II. I couldn’t even pronounce the word shetetl and I didn’t understand why I had to waste time seeing a village where Jews no longer lived. 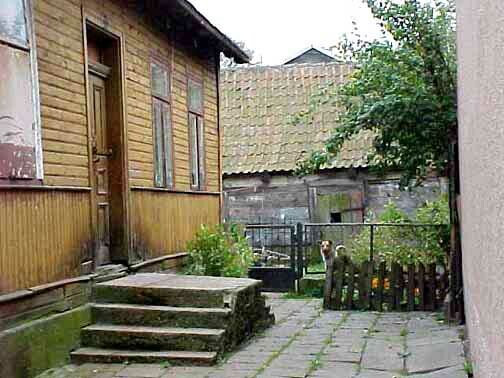 Many of the houses in Tykocin look like barns, with what appears to be a hayloft in the attic space, but you can tell they are dwellings because they are right next to the sidewalk and have curtains in the windows. 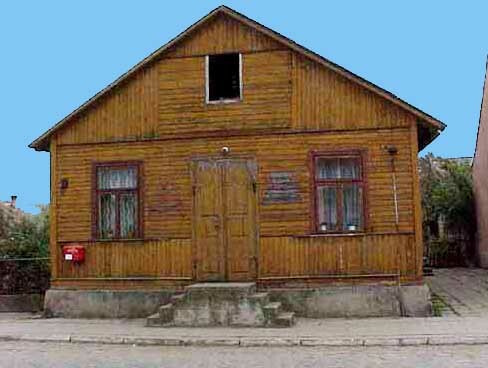 The German name for the shtetel Jews was Dorfjuden, or village Jews in English. A few of these villages had a population that was 100% Jewish, but in most of them, the Jews lived side by side with the Polish Catholics. The town of Tykocin was divided down the middle into the Jewish district on the west side and the Christian district on the east side. 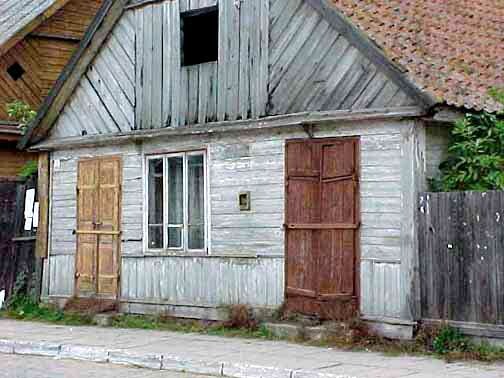 The weathered gray wooden house shown at the top of this page appears to have shutters on the two doors which are closed and barred. On the top of the house is a window which looks like an opening into a hayloft. To prove that these buildings are not barns, I took a picture of a barn in the back yard of the house, which is shown in the photo below. If these barn-like houses look familiar, it may be because you have seen houses just like them in the movie Fiddler on the Roof. 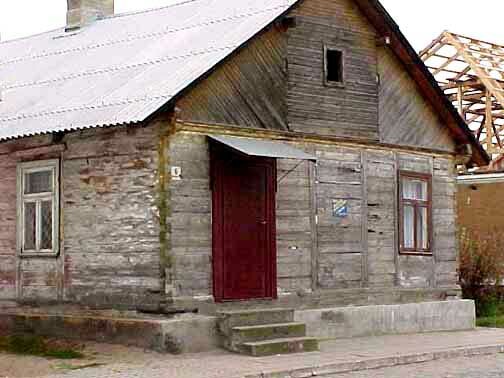 When these houses were last inhabited by shtetel Jews, most of them did not have indoor plumbing. According to historian Martin Gilbert, there were whole villages in Poland, as late as 1945, that did not have running water, indoor toilets or a sewer system. There was no industry in Tykocin then and, according to my tour guide, the inhabitants were engaged in farming, including the Jews. After Poland was partitioned for the third time in 1795, Tykocin was located in the section that came under the control of Russia. 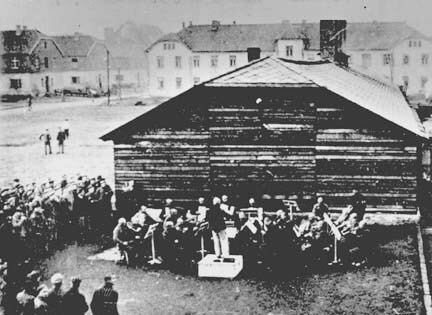 Between 1835 and 1917, Tykocin was included in the Pale of Settlement, the reservation where the Jews were forced to live by decree of Russian Czar Nicholas I. The movie Fiddler on the Roof depicts the life of the Jews in the Pale and ends with the start of their expulsion in 1881 after the assassination of Czar Nicholas I during the revolutionary activity, that was just beginning, which finally culminated in the overthrow of Czar Nicholas II by the Communists in 1917. Two million Jews were expelled from the Russian sector of the former country of Poland between 1881 and the start of World War I in 1914. Most of the Jews from the Pale of Settlement came to America, but some settled in Germany or the Austro-Hungarian Empire. In 1917, some of the Jews from the Pale of Settlement, who had emigrated to America, returned to fight in the Communist Revolution. This morning, I was reading about three Auschwitz survivors, who now live in South Florida. They were on this year’s March of the Living. You can read the article here and see a video about their trip here. 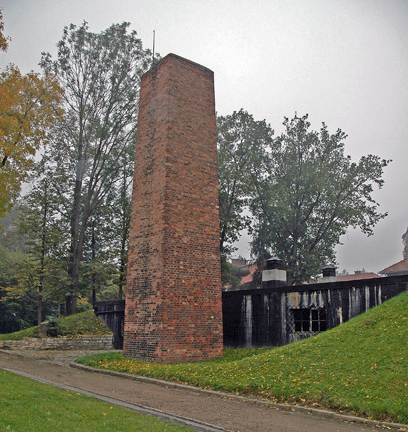 The March of the Living also goes to the Maidanek (Majdanek) camp, where the people on the march can see gas chambers and a reconstructed crematorium. What impressed me about the story of the three Auschwitz survivors on the March of the Living is how lucky they were to have survived their ordeal in a death camp and to have been able to come to America where they could live the good life. As the trio travels back to Auschwitz in Poland, each tells a terrifying story about being ripped from their homes and loaded onto crowded trains, with no idea where they were going or what would happen to them once they arrived. Standing on the train platform at the Birkenau extermination camp, part of Auschwitz, Mermelstein remember the being greeted by the infamous Dr. Joseph Mengele, the man who performed cruel medical experiments on children and adults being held by the Nazis. “He looked at you, had on white gloves and a little stick and just motioned right or left.” Mermelstein is explaining what became known as “the selection process.” In that split second, people where chosen for life or immediate death in the gas chamber. No one realized at the time what was happening. 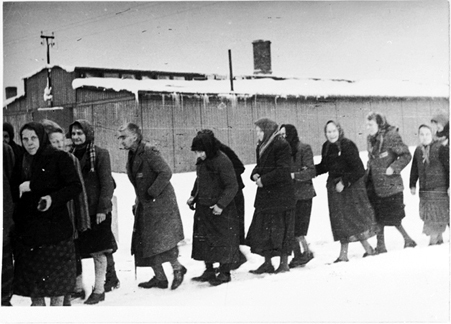 “The people went to right went this way, people who went to left, right behind the fence there, there’s a walk way, they walked about a half a mile to where the gas chambers,” recalls Mermelstein. 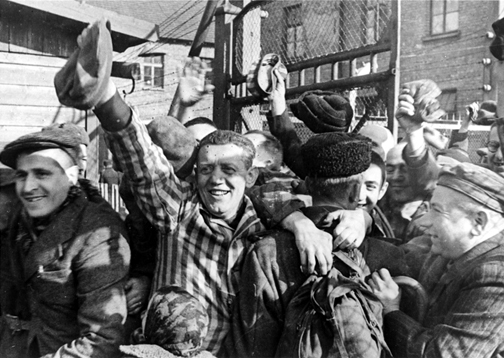 The photos below show some of the survivors of Auschwitz-Birkenau, the people who were sent to the right during the selection process, and they survived.